I’m not a public individual. I avoid answering the phone, shy away from Facebook posts that reveal more than a glimpse of me, and I sometimes keep my true feelings barricaded behind a wall. I’m quite cautious of who I let in and how much I share with them. At my core, I’m an introvert. This means I don’t seek reassurance or comfort from the company of others (though I do enjoy it). Instead, I am an inwardly intuitive individual who gathers her thoughts and serenity from quiet moments away from chaos. So why, WHY, is an introvert writing a blog?! Because I’m a walking oxymoron, for starters. I’m driven to divulge my inner self through the written word while simultaneously sitting mum. But I say this with no amount of self-deprecation. If there’s one thing I can say for my juxtaposing qualities, it’s that I’ve fully come to love each and every one. If you are to take this journey with me, perhaps you’d like to better understand me. So I will begin the divulgence by describing myself through the results of two very standardized tests. While I don’t promote creating a self-image solely based on what a computer can spit back at you after answering a battery of questions, I can attest that these surveys provided apt wording to describe me. In their results I found the vocabulary and the concise conclusions of my behaviors and habits. Additionally, they help show how and why this blog came to be. So I will briefly share them with you. 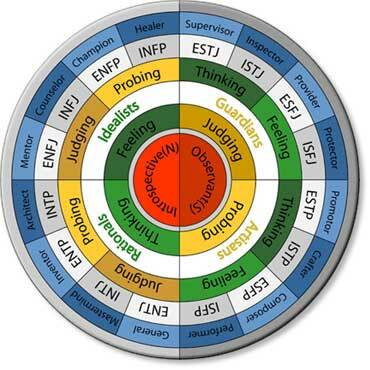 First, the Myers-Briggs Type Indicator. I’m tempted to sing the praises of this test. But, rather, in short, I will say that as a student of Psychology, I have taken it countless times and in varied settings but have ALWAYS received the same result and never lacked surprise at its accuracy. So here it is: INFJ. Any of you out there? Briefly, an INFJ is a very sensitive individual. She is outwardly systematic but inwardly follows her own emotional compass. She is highly intuitive, gentle, caring, and complex, yet quite private. Her perfectionism leads her to be stubborn about her ideas and keeps her striving for constant growth. She is a natural nurturer, capable of great depth of feeling, creative, and quite devoted. But she will always seek more for herself, turning inward for balance and direction. I and all other INFJs make up about one to three percent of the population. We are a rare breed. The next description comes from a test with which I am a lot less familiar. But, as with the Myers-Briggs, the results of this test described a piece of me so well it was as if the categories were based on my own practices. This one is called the StrengthsFinder, an assessment often used in the workplace to help classify each employee’s strengths. Though this test certainly does not capture the “essence” of the individual, it does find a way to reveal the implements we each have in our tool belts, which shape the way we approach projects, interact with coworkers, even what we strive to do in our professional (and personal lives). The results of this test captured my strengths so well that I almost felt violated, placed under an X-ray machine without my consent. But, again, knowing that not this nor any test could take the place of the living breathing Gretchen, I allowed myself to see these results as a convenient description of what I’ve always known about myself, as well as a reference for ideas on how to leverage these strengths. In synopsis, I crave knowledge. I can’t sit still when there is more to learn, and there is always more to learn. I want to input as much information into my brain as possible so that I am able to engage in intellection and think critically about what this new information means. Sometimes I like to input information about other individuals, because what makes sense for my brain is to truly understand a person from a socio-historical point of view. I want to grasp who and what so that I can then wrap my head around the how and why of a person’s behaviors, decisions, comments, and, ultimately, feelings. Lastly, I’m an obsessively strategic soul, who takes all decisions, including what to eat for breakfast, five steps forward so that before I even imagine taking action, I already see the various potential repercussions and outcomes. These two tests fit quite well together. One captures the internal pathways, the way I like to organize and plan but in the moment end up following my whims, how I can be stubborn and staunch yet deeply empathetic and passionate. The other explains the way I interact with my world – my obsession for learning, my restlessness and need for constant intellectual stimulation. No test can ever capture my essence, but these two certainly help explain my quirks and inner workings. This blog was born out of my yearning to write and share a piece of myself in the way I best interact with the world. It was also born out of the desire to find balance again, and I realized the best way to do so was to use my strengths, to learn new things, input new ideas, engage in intellectual thinking, strategize about how to apply what I’ve learned and individualize to myself while also, hopefully, making a connection with others. My monthly challenges will sometimes be physical, other times mental or emotional. Some will be fun, silly, or recreational, helping me find or recreate hobbies, get in shape, get out in the world, while others will force me to turn inward to realign with my values. And now that I’ve given you a different glimpse of me, I hope that you will better understand the how and why of my own journey as we walk together. This entry was posted in Reflections and tagged INFJ, Introvert, Myers-Briggs, personality types, Strengthsfinder. Bookmark the permalink. I’m an INFJ too! I knew there was a reason I was drawn to your blog! Wow! Two Emmetts and two INFJs. What a cool connection! Thanks for reading, Sue!